The concept of a Process Diaphragm Triplex Pump is a fixed stroke reciprocating plunger pump where the process fluid is handled by mean of a diaphragm actuated through an intermediate fluid.The reciprocation movement of the plunger displaces the oil contained in a pump chamber which in turned moves a diaphragm house in the front end of the pump. The process fluid sucked and discharged by the alternate bending of the diaphragm which avoids the process fluid enters in contact with other parts of the pump and with the atmosphere. 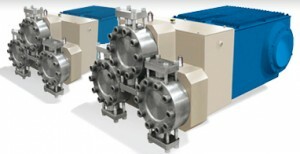 Process Diaphragm Pumps are a version of TITANO and PTO/PQO/PSO. Reciprocating Plunger Pumps Series and use standard power ends and liquid ends with hydraulically actuated diaphragms. The solution is use for handling any hazardous fluid, when stringent environmental regulations have to be met and when the “plunger leakage solution” is not accepted within the project.